Among other factors affecting drug abuse in teenagers and young adults are environmental factors such as family, school and peers and relations with other victims of drug abuse. ,,,,,,,,,,,,, Some studies also reported that educational factors such as academic failure ,,, and social factors ,,,, can affect drug abuse. Since numerous factors can lead to drug abuse, especially when one considers different social, group and age factors, a number of different approaches for dealing with drug abuse have been proposed by the experts of this field. In information dissemination approach, the hypothesis is that the main reason behind drug abuse is ignorance about its adverse effects. Some studies show that this approach and simply increasing awareness doesn't lead to prevention, and some even believe that this method can stimulate the curiosity of people thus increasing the risk of first-time drug abuse. Therefore, one needs to use more complex social models in order to prevent drug abuse. In the social influence approach, the emphasis is on the social and psychological factors that are believed to affect drug abuse. For example, the start of smoking in many teenagers is due to presser from peers and relations with friends who themselves smoke. Therefore, the methods for fighting these social and psychological factors are thought to the subjects. The most important weakness of this method is disregarding personal factors. Due to the importance of identifying the stimulating and inhibiting factors in drug abuse, the current study aims to identify these factors according to educators, officials, teenagers and young adults in the city of Isfahan. This study uses descriptive field method. The statistical population included expert groups (including educators, managers, cultural and law enforcement officials, psychologists, social workers and consultants of government and private sectors and nongovernmental organizations) and risk groups (teenagers and young adults) in the city of Isfahan in year 2009 (1388). The study sample included 300 members of each group for a total of 600 participants that was selected using nonprobability and random sampling methods and interviewed. Data gathering was carried out using semi-structured interviewing. In the interview of experts group, five open questions were used with each one relating to the area of the expertise of the one being interviewed while target group's interview consisted of eight open questions. The field interviewers were educated to prevent them from leading the interviews, making it possible to extract precise information from the content of the interviews. In order to interview teenagers and young adults, the interview team visited places where these age groups frequented such as cultural and art institutes, stadiums, mosques, parks and addiction treatment centers. In order to analyze the gathered information, the content of the interviews was categorized and coded, and frequency and percentage of each one was reported. The findings presented in [Table 1] show that the three most important factors in drug abuse are need for happiness and lack of proper recreational activities, dealing with life problems and stress and unemployment, respectively. Most of the teenagers and young adults that were interviewed considered unemployment, psychological distress and illnesses and deficiencies and shortcomings to be the major stimuli in drug abuse [Table 2]. 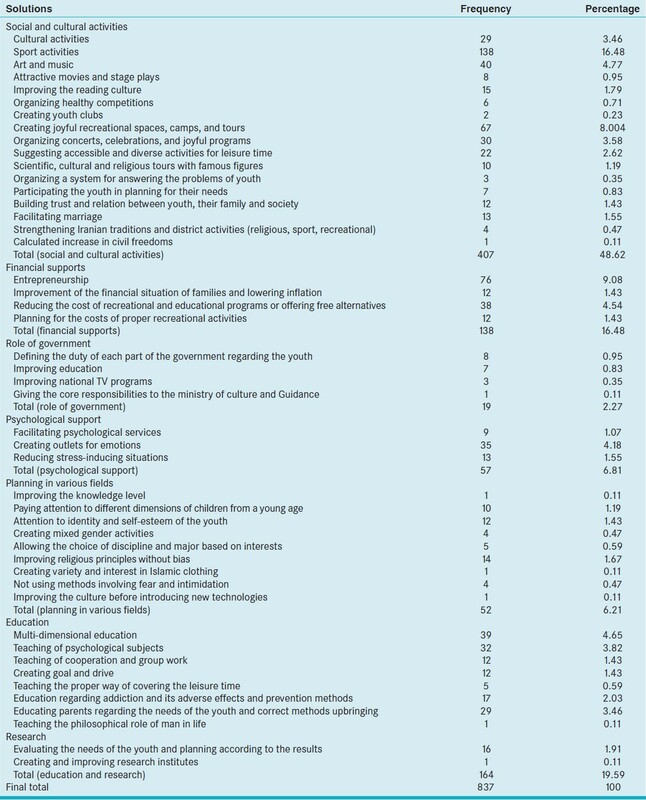 The findings shown in [Table 3] suggest that according to teenagers and young adults sports, Proper recreational activities and gaining suitable employment are among the best alternative solutions to drug abuse. Educators and officials believe that cultural activities to be the most important factors in inhibiting drug abuse in teenagers and young adults and specifically believe sport activities, Entrepreneurship and Creating joyful recreational spaces, camps and tours to have the best effect in inhibiting drug abuse [Table 4]. According to teenagers and young adults of Isfahan the most important factors for inclination toward drug abuse are need for happiness and lack of proper recreational activities, life problems and stress, unemployment and bad friends [Table 1]. 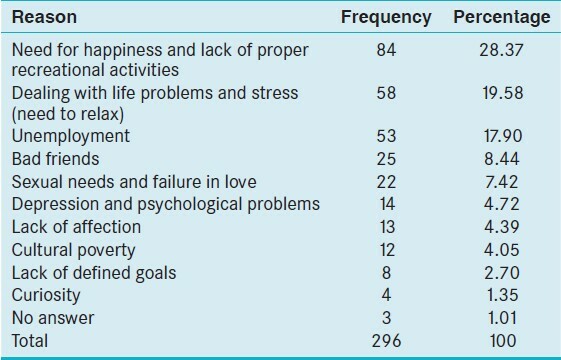 According to the result presented in [Table 2], the target group considers similar factors such as unemployment, psychological and mental disorders, shortcomings and pressure from friends to be the important factors for inclination toward drug abuse. Other studies report the factors stimulating drug abuse. 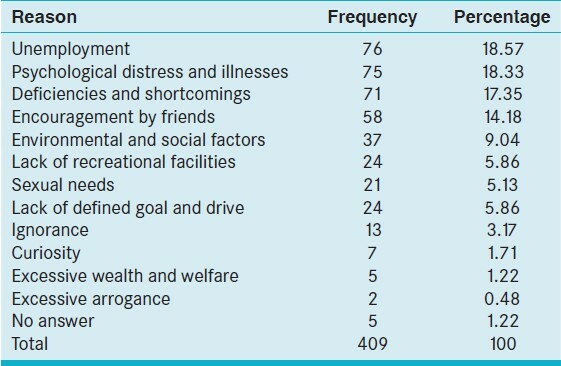 Some of these factors are depression and anxiety reported by Assarian et.al (2004), depression and peer pressure reported by Molavi and Rasoolzade (2004), lack of proper recreational activities reported by Vafayi and Shahamfar (2004), peer pressure reported by Forooghodin et.al (2004), gaining happiness and addicted friends by Ziaodin (2006), unemployment and lack of recreational facilities by Allahverdipour (2006), curiosity by Najafi et.al (2006), harmony with peers by Farhoudian (2006), curiosity, pleasure and Exhilaration by Keyvanara et.al (2007), peer pressure by Barooni et.al (2007), harmony with peers by Syam (2007), friendship groups by Fezallahi (2008), need for happiness and curiosity by Beyrami (2008), curiosity and unemployment Conger (1979), addicted friends, depression and anxiety by Forman and Linne (1991) psychological illnesses by Weiner (1992), psychological disorder by Brook and Newcomb (1995), extreme thrill seeking by Brown et.al (2001) and Acton et.al (2002), harmony with peers by Agrawal (2007) ,,,,,,,,,,,,,,,,,,, which are in agreement with the results of this study. Due to their high energy, thrill seeking and active nature, teenagers and young adults need to have access to recreational activities. Therefore, these age groups always look for ways to get their happiness and thrill. If the proper methods and recreational activates are present in the society, teenagers and young adults rarely seek improper methods. However, when there is a lack of proper recreational activities, teenagers, and young adults seek other methods to satisfy their desires and recommend them to their peers; these methods might not be proper or productive. Although the need for recreational activities differ from person to person, in order to guide the energy of the youth toward the betterment of the society, one needs to make sure everyone has access to enough outlets to satisfy the demands of his or her energy and thrill seeking. On the other hand, technological, cultural, economic, and industrial changes have changed the life conditions, needs and beliefs of people. These changes can lead to a contradiction, conflict, frustration, and stress that can have negative and adverse effects on a person especially in the long term. Therefore, if people are unfamiliar with proper counters and management methods, lack proper support and have weak and passive will, they will be more susceptible to trying methods suggested by others without thinking of the consequences. Unemployment is one of the other factors that increase the inclination toward drug abuse in teenagers and young adults. Unemployment can be analyzed from two perspectives: (1) being unemployed and the inability to find employment and (2) inability to fill the free time caused by unemployment in a productive manner. Unemployment causes the person to feel unless, impotent and dependent on others. However, the second consequence of unemployment (too much free time) is of even greater importance. When a teenagers or young adult has a lot of free time but no reliable plan for filling the said free time, it creates a lack of plan and purpose which makes one susceptible to suggestions offered by others regardless of their consequences. In some situations, the psychological, mental and spiritual characteristics of a person can stimulate drug abuse. These risk inducing characteristics need to be controlled and cured. Some people seek easy ways to reach their goals regardless of the consequences. Other times curiosity and a desire for knowledge can lead people to take up drug abuse. Many will never believe that curiosity that is normally thought to be a positive characteristic can create problems for them. According to teenagers and young adults of Isfahan, sports, proper recreational activities and employment are the major factors inhibiting drug abuse [Table 3]. Also, educators and officials considered cultural and social activities especially sports activities, Entrepreneurship and creating joyful recreational spaces, camps and tours to be able to inhibit drug abuse in teenagers and young adults [Table 4]. In other words, the results shown in [Table 3] and [Table 4] complement each other and show that both the target group (teenagers and young adults) and officials have identified the factors inhibiting drug abuse and are in agreement with each other. In these results, sport is considered to be a productive activity which provided ample opportunities for strengthening body and mind and a suitable outlet for the pent up energies of the youth. Being involved in sports activities gives one a certain mentality that reduces the chances of selecting unhealthy and damaging paths. On the other hand, cultural activities help people to use their creativity and empathy. Those involved in these activities learn to accept responsibilities, create ideas and participate in group activities and thus satisfy part of their social needs. Young people are full of energy and excitement and therefore need to participate in fun and enjoyable activities, alone and in groups. If these needs are not met, they will show themselves in other forms. One can say that these activities are the bottleneck that controls the lives of teenagers and young adults who are by nature excitable and thrill seeking and often don't have the prudence and experience of older people. Also, constant supervision is required to keep the programs designed for youth healthy and on the right track. Artistic and musical activities help people to create a happy environment for themselves and others. Also, empowerment of traditional and religious beliefs helps the youth to know the history and traditions of their country and feel proud of their heritage instead of rejecting it, which can be the answer to suppressed emotions and lack of identity present in the youth. From an economic point of view, there is great emphasis on entrepreneurship and creating suitable work environments for the youth because after entering a certain age teenagers and young adults desire to be independent, especially from a financial point of view. Young adults who have recently graduated from collage but are unable to find employment can't easily depend on their parents' support. Being forced to depend on others when they desire to be independent can lead them toward unhealthy and dangerous behaviors. The results of this study show that various cognitive, attitudinal, social and personal factors affect the inclination of the teenagers and young adults toward drug abuse and that these target groups are in need of more attention. One interesting fact shown in the results is that based on the opinion of the interviewed people, the factors stimulating and inhibiting drug abuse overlap with each other. Therefore, one can conclude that the best prevention method is one that considers a wide variety of factors stimulating and inhibiting drug abuse. Also sports activities, employment and joyful recreational spaces, camps and tours are among the needs of the target group and given the fact that prevention is better than cure, planning for satisfaction of these needs and other needs of teenagers and young adults if of great importance. Mooney L, Knox D, Schacht C. Understanding Social Problems. USA: Wards Worth; 2006. Shabani S. World Drug Report on the Cultivation, Production and Consumption of Drugs in 2000. Tehran: NAJA office of Narcotics; 2001. Khastoo G. Prevention of drug abuse and dependence with community-based approach. Soc Welfare 2002;2:235-64. Dana FR, Ghorvi A. Drug market in Iran and Tehran. Soc Welfare 2001;1:67-87. Jazayeri A. Raffiyi H, Nazari M. Attitudes of secondary school students in Tehran on addiction. Soc Welfare 2006;2:217-30. Manshaei GH, Samouei R, Valiani M. The effect of life skills training on prevention of youth addiction in Isfahan. First Conference of Scientific Explanation of Victims and Preventive Measures. Islamic Azad University of khorasgan; 2002: 481-90. Movaghar VR, Rakhshani F, Mohammadi M, Sadjadi SA, Movaghar AR. Opioid misuse and its predisposing factors in patients with pain. Journal of Tabib Shargh 2002;4:171-81. Bolhari J, Peyravi H, Nourizadeh M. The models of addiction prevention. The seminar papers of addiction among adolescents and young people. Tehran, Iran: Iran University of Science and Technology Publication; 1993. Barooni SH, Mehrdad R, Akbari E. A survey of ecstasy use among 15-25 year-olds in five areas of Tehran. J Tehran Univ Med Sci 2008;65:49-54. Koosha M, Alaghbandrad J, Shahrivar Z, Tehranidoost M, Mohammadi M, Kyani A. The pattern of drug use in boy adolescents with attention deficit-hyperactivity disorder. Adv Cogn Sci 2003;5:64-72. Narenjiha H, Rafei H, Baghestani A, Nouri R, Shirinbayan P, Vojdani R, et al. Rapid Assessment of Drug Abuse in Iran. Tehran: Dariyoush Institute; 2004. Nedaf A, Makoyi A, Seyedin M. Correlates of addiction. Soc Welfare 2008;7:169-92. Najafi K, Fekri F, Mohseni R, Zarabi H, Nazifi F, Faghirpour M. A study on prevalence of drug use among high school students in Gilan. J Med Univ Gilan 2006;16:67-79. Amani F, Ahari S, Mohamadi S, Azami A. Pattern of drug use changes in addicts of drug rehab center. J Med Univ Ardebil 2005;5:220-4. Khalkhali M, Najafi K, Nazifi F. Prevalence of drug use and medicine in people dependent on opiates. J Med Univ Gilan 2005;15:40-7. Movaghar AR, Elahe SE. Drug use among country students. Soc Welfare 2005;5:9-30. Movaghar AR, Izadyan ES, Younesyan M. A review study on drug use among students in country. Payesh 2006;5:83-104. Glantz MD. Vulnerability to Drug Abuse: Introduction and Overview. Washington, DC: American Psychological Association; 1992. Mathias R. Novelty seekers and drug abusers tap same brain reward system. animal studies show. Prev Res NIDA 1995;10:10-5. Kopstein AN, Crum RM, Celentano DD, Martin SS. Sensation seeking needs among 8 th and 11 th graders: Characteristics associated with cigarette and marijuana use. Drug Alcohol Depend 2001;62:195-203. Office of National Drug Control Policy. National youth Anti - Drug Campaign: Scientific and Situational Bases for the Strategy, Media Campaign Publication; 2002. Acton GS. Measurement of Impulsivity in a Hierarchical Model of Global Personality Traits. San Francisco: University of California; 2002. Brown SA, Mott MA, Stewart MA. Adolescent Alcohol and drug abuse. In: Walker CE, Roberts MC, editors. Hand Book of Clinical Child Psychology. 3 rd ed. New York: John Wiley and Sons, INC.; 2001. Petraitis J, Flay BR, Miller TQ. Reviewing theories of adolescent substance use: Organizing pieces in the puzzle. Psychol Bull 1995;117:67-86. Brook JS, Newcomb MD. Childhood aggression and unconventionality: Impact on later academic achievement, drug use, and workforce involvement. J Genet Psychol 1995;156:393-410. Weiner IB. Psychological Disturbance in Adolescence. 2 nd ed. New York: John Wiely and Sons, INC.; 1992. Taremian F. Substance abuse in adolescents. Tehran: Training Publications, 1999. Leukefeld CG, Clayton R. Prevention Practice in Substance Abuse. U.S.A: Haworth Press; 1995. Forman S, Linne L. School based social and personal coping skills training. In: Donohew L, editors. Persuasive Communication and Drug Abuse Prevention. U.S.A: Lawrence Embaum Association; 1991. Stevell BK. Drug Abuse Hand Book. United States of American: CRC Press publisher;1995. Samouei R. Methods of prevention of drug abuse and psychotropic medications, depending on the type and pattern of drug use among adolescents and young people. Isfahan: Department of Social Studies, 2009. Hawkins JD, Catalano RF, Miller JY. Risk and protective factors for alcohol and other drug problems in adolescence and early adulthood: Implications for substance abuse prevention. Psychol Bull 1992;112:64-105. Baumrind D, Moselle KA. A development perspective on adolescent drug abuse. Adv Alcohol Subst Abuse 1985;4:41-67. Chirillo S, Brini R, Cambiaso J, Maza R. Drug Addiction in the Mirror of Relationships. Pirmoradi S (translator). Isfahan: Homam Publication; 2001. Hedayati D, Aghazade KH. Psychological Profile of Addicts in Ardebil. Ardebil: Research University of Ardebil, School of Literature and Humanity; 2003. Masson PH, Kagan J, Carol HA, Kanger JJV. Personality development of children. Yasyai M (translator). Tehran: Markaz Publication; 1989. Botvin GJ, Griffin KW, Diaz T, Miller N, Williams MI. Smoking initiation escalation in early adolescent girls: One - Year follow - up of a school- based prevention intervention for minority youth. J Am Med Womens Assoc 2004;54:139-43. Ziyaodin H, Zarezade A, Heshmati F. The prevalence of drug abuse and addiction and its associated factors in senior high school and college students of Kerman in 2000-2001. J Kerman Univ Med Sci 2006;13:84-94. Zahirodin A, Kyani A. Study of pathological factors in childhood and drug abuse disorder in ages of 30 and 20. In Tehran. Sci J Hamedan Univ Med Sci 2003;10:38-42. Forooghodin A, Sadrolsadat J, Bigleryan A, Yegane MJ. the effect of juxtaposition and interaction with outlaw people and youth's attitudes to addiction. Soc Welfare 2005;4:319-32. Feyzallahi A. Social factors associated with drug addiction among youth in Ilam. Soc Wel 2008;7:319-32. Beyrami HJ, Bakhshian F, Vahidi R, Asl A. High risk behaviors and attitudes of secondary school students in Tabriz toward drugs of abuse. Iran J Psychiatry Clin Psychol 2008;14:350-4. Syam SH. Drug abuse prevalence between male students of different universities in Rasht in 2005. Tabib Shargh 2007;8:279-85. Brower AM. Are college students alcoholics? J Am Coll Health 2002;50:253-5. Rooznahan D, Seligman M. Psychopathology. Mohammad Y (translator). Tehran: Savalan Publication; 2001. p. 1380. Mohammadi MR, Amini K, Khah MR. Survey of social and environmental factors related to the relapse of addiction in volunteer addicted individuals in welfare organization of Zanjan. Sci J Zanjan Univ Med Sci 2007;2:85-94. Molavai P, Rasoolzade B. Factors influencing the trend of youth drug use. Q J Fundam Mental Health 2004;6:49-55. Saidpour E, Soltatni S. Evaluation of Drug Trafficking and Addiction. Zahedan: Rehabilitation of Zahedan, Sistan and Baluchestan Planning and Budget Organization; 1988. Milanifar B. Mental Health. Tehran: Ghoms Publication; 1997. Johnston LD, Bachman JG, O'Malley PM. Student drug use in America, (DHHS Publication NO'ADM 82-1208). U.S. Department of Health and Human services. Washington, D.C: National Institute on Drug Abuse; 1981. Coleman WJ, Cressey DR. Social Problem. U.S.A: Harper Collins College Publisher; 1992. Caetano R, Clark CL, Tam T. Alcohol consumption among racial/ethnic minorities: Theory and research. Alcohol Health Res World 1998;22:233-41. Ellickson PL, Bell RM, McGuigan K. Preventing adolescent drug use: Long-term results of a junior high program. Am J Public Health 1993;83:856-61. Bandura A. Social Learning Theory. Englewood Chiffs, NJ: Prentice Hall; 1997. Botvin GJ, Baker E, Dusenbury L, Botvin EM, Diaz T. Long- terms follow up results- of a randomized drug abuse prevention trail in a white middle class population. J Am Med Assoc 1995;273:1106-12. Botvin GJ, Eng A, Williams CL. Preventing the onset of cigarette smoking through life skills training. Prev Med 1980;9:135-43. Botvin GJ, Goldberg CJ, Botvin EM, Dusenbury L. Smoking behavior of adolescents exposed to cigarette advertising. Public Health Rep 1993;108:217-24. Caplan M, Weisberg RP, Grober JS, Sivo P, Grady K, Jocoby C. Social competence promotion with inner- city and suburban young adolescents: Effects on social adjustment and alcohol use. Icons Cline Psycho 1992;60:56-63. Assarian F, Abdollah O, Akbari H. Psychological and personality characteristics of young addicted subjects in Kashan. Feyz J Kashan Univ Med Sci 2004;8:37-42. Vafayi B, Shahamfar J. Factors Influencing students' attitudes to smoking in Tabriz City. J Babol Univ Med Sci 2004;7:57-62. Meysamie A, Faramarzi B, Holakouie-Naieni K. How addicts think about addiction and community problems. J Tehran Univ Med Sci 2006;5:34-43. Allahverdipout H, Heydarnia A, Kazemnejad A, Kim W, Shafei F, Azadfalah P. Applying fear appeals theory for preventing drug abuse among male high school students in Tehran. Sci J Hamedan Univ Med Sci 2006;13:43-50. Farhoudian A, Rahimi-Movaghar A, Goodarzi RR, Younesian M, Mohammadi MR. Changes in the use of opioid drugs and available interventions in bam during the first year after the Earthquake. Hakim 2006;9:52-7. Keyvanara M, Kyanpour M, Jeyanpour M. Medical Process of Addiction among Drug Abusers Referring to Quit Addiction. Isfahan: Health Humanities Research Center, School of Management and Medical Informatics, Isfahan University of Medical Sciences; 2007. Conger JJ. Adolescence: Generation Under Pressure. New York: Harper and Row; 1979. Agrawal A, Lynskey MT, Bucholz KK, Madden PA, Heath AC. Correlates of cannabis initiation in a longitudinal sample of young women: The importance of peer influences. Prev Med Int J Devoted Pract Theory 2007;45:31-44.